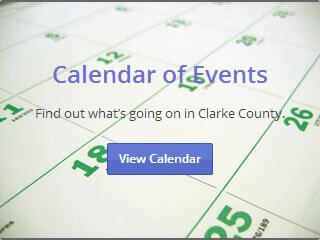 Welcome to the Clarke County Probate Court website. This website was established to help you answer any questions you may have regarding the duties, responsibilities and scope of the Probate Office. Serving you as your Probate Judge is truly an honor! I hope you find our website helpful and easy to navigate. My staff and I look forward to assisting you. Clarke County has a long and varied history. What we now know as Clarke County was originally part of the Mississippi Territory. On December 10, 1812, the area that encompassed Washington County, Alabama was split, creating Clarke County as a separate county. Clarke County was named after General John Clarke of Georgia, a noted politician of the day. The Alabama Territory was formed from the Mississippi Territory on March 13, 1817. The Alabama Territory, in turn, became the State of Alabama on December 14, 1819. Court was first held in Clarke County at the home of John Landrum near Winn in February, 1813. The county did not have a county seat in the beginning, so various private homes in the area were used as court facilities. The home of William Coate became the meeting place in 1819. It was located in Clarkesville, where a courthouse and jail were built. Thus it became the first County seat of Clarke County. Clarkesville did not have an adequate water supply, so the County seat was moved to Grove Hill, which was then known by the name of Macon, in 1832. The name Macon was changed in the 1850’s and the name of the County seat became Grove Hill. “Clarke County, Alabama and Its Surroundings.” by Rev. T. H. Ball, says “the Commissioners Court of Clarke County received proposals in February, 1837 for the erection of a fire proof brick building for a county and circuit court clerk’s office, for the safe keeping of the records of said county.” In the beginning, an Orphan’s Court met at certain intervals to handle both probate and orphan’s business. It served as not only the main administrative and legislative body in the county, but also had limited criminal and civil jurisdiction. In 1821 the system changed to one judge and one clerk, as opposed to the five-judge panel that was required to sit at Orphan’s Court. The other judges became the Commissioners Court. A Probate Court was established in each county in 1850, consolidating the positions of judge and clerk. County court functions, with the exception of criminal and civil jurisdiction, were transferred to Probate Court. Since that time, the Probate Office has expanded its responsibilities to include election administration, record keeping, and in some instances, licensing. The Probate Court no longer has jurisdiction for juvenile justice, that responsibility having become the job of district court in 1977. Probate Court as we know it today consists of administering elections, wills and estates, adoptions, appointing Notary Publics, name changes, marriage licenses, property records, involuntary commitments to the State Department of Mental Health, corporation records and various other duties. In Clarke County, the Probate Office and what is now the License Commission Office split off in 1989, creating two separate offices. The License Commission office handles all tag and business license matters, while the Probate Office handles all recording and Probate Court matters. Unlike Circuit or District Court, where matters of criminal, traffic or civil proceedings take place, the Probate Court deals with life events. From adoptions and legitimations to wills and estates, Probate Court touches the lives of people from birth to death. All citizens of Clarke County, regardless of age, race, gender, social or economic status, regularly come into contact with Probate Court. The Probate Court is the Court of the People. This website is to help you understand what proceedings go through Probate Court and to help you have a working knowledge about them. Please refer any specific questions regarding proceedings to your attorney. 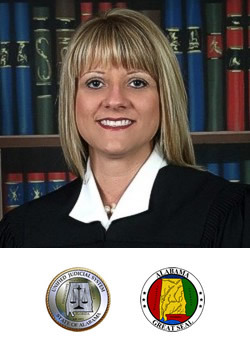 The Judge of Probate is the Chief Election Officer of Clarke County, Alabama. Approximately 18,505 persons are currently registered to vote in Clarke County. Please take a moment to browse our website as you prepare for the next election. If you have further questions, please feel free to call the Clarke County Probate Office at 251-275-3251. NOTES FOR RECORDING: Please double check your fees on recording documents to make sure you have the correct amount. Documents sent without exact fees will be returned for correct amount. We may not be able to call you about correcting a fee due to the number of documents received. Documents being hand delivered must be in the office by 4:30 p.m. Multiple documents or large packages must be in earlier to insure recording for that day. We accept checks, money orders or cash. Please note that no personal out of state checks are accepted. We ask that your office send a self addressed stamped envelope large enough to hold your documents with the correct postage on it for returning all mailed documents. NOTE: Beginning August 1, 2012, any deed, bill of sale, or other instrument of like character which conveys any real or personal property within the state or which conveys any interest in any such property presented for record in the Probate Judge’s office to be accompanied by proof of the actual purchase price paid or if not sold proof of the actual value of the property conveyed. THIS FORM MUST BE FILLED OUT COMPLETELY WHEN THE DEED IS PRESENTED FOR RECORDING. If there is not a sale price, you must put an approximate value for the property on the form. Contact the Tax Assessors office either via phone at (251) 275-3376 or through their website: www.alabamagis.com/clarke. If the conveyance document presented for recording contains all of the necessary information and is attested, the conveyance document will constitute compliance with the provisions of the Act and the filing and submitting of the form will not be required. However, in order for the form to not be required, the following information MUST be on the document: grantor AND grantees names and mailing addresses, the physical address of the property being conveyed, the actual purchase price paid or the actual value of the property being conveyed. Our office will record the form as part of the instrument recording, so please note that an additional page will be included in all filing fees when utilizing the form provided by the Department of Revenue. If you have any questions about this new procedure, please contact our office at (251) 275-3251. ***Document must state if minerals are producing. If minerals are producing, then deed tax must be paid on value of minerals conveyed. If minerals are not producing, then the mineral tax is paid and the minimum amount for deed tax is due, unless there was a consideration paid for the mineral, in which event you would use the deed tax amount based on the consideration paid. PER THE CODE OF ALABAMA, 1975, the Probate Office no longer accepts UCC filings unless the lien is for real estate or attachments to real estate, such as timber, minerals, etc. The UCC must have a description of the real estate. All other filings are solely with the Office of Secretary of State. Lease tax is calculated by multiplying the annual rental amount by the term of lease to get the amount of taxable rent, then multiplying that amount by the percentage (an 8% discount factor) to get the amount for determining deed tax. Percentage sheet and calculation forms are available upon request from clerks. All corporate filings must have separate checks made payable to Probate Court and the Secretary of State’s office for appropriate fees. Marriage Licenses and ceremonies are not available at the Clarke County Probate office. Clarke County residents who are seeking marriage licenses can do so at any Probate Judge’s office in the state that offers that service. The law does not require that a marriage license be bought in the county of your residency. Bond, application and $25.00 filing fee must be sent to Clarke County Probate Court. Once appointed, you may purchase your stamp and Notarial Seal from any office supply store or county newspaper office, such as the Clarke County Democrat or South Alabamian.